If I didn’t know that Finns were good at finding creative solutions to problems, I would think Cara Giaimo was pulling my leg. Belatedly, I give you her Atlas Obscura story about reindeer that glow in the dark. 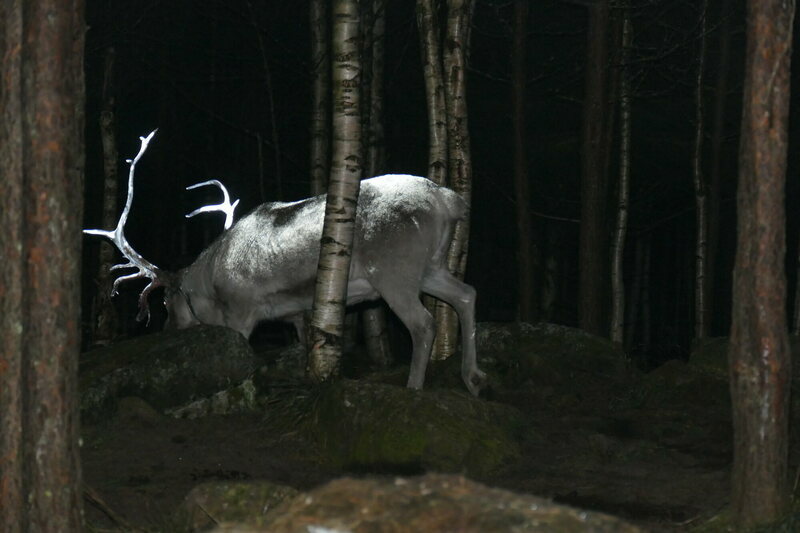 “If you’re on the lookout for magical reindeer this year, don’t bother gazing skyward — turn your attention to Finland, where local herders are using iridescent antler paint to cut down on deer-car collisions. “In Finland’s Lapland region, vehicles share space with huge groups of freely roaming reindeer, herded by the Sami people. During the long, dark winter, this coexistence can be dangerous. Wow, that is spooky. But creative and worthwhile, too. Yes! That movie is my kids’ favorite! I already have this image of Lapland as being a magical place apart–and the mysterious glowing reindeer fit the image perfectly! For years at Christmas, we put up a poster about Santa that claimed he lived in Finnish Lapland. I’m inclined to believe it.